How much storage do you really need on your smartphone? The amount of internal memory varies from device to device. In some cases, you could use a microSD slot, but this isn't always possible. How much memory do we really need on our smartphone? Well, it depends on how you use it. The options on the market: what to choose? There are a huge variety of devices out there for Android, all equipped with different internal memory and RAM. Depending on the price range, your options change, but you can see how far manufacturers have come with this compared to some years ago, especially in the mid-range where 3GB of RAM and 32GB of storage are now the norm. For this reason, life is easier for Android users compared to iPhone users. Manufacturers release devices with 8, 16, 32, 64, 128, 256, and 512GB of internal storage. In fact in 2019 it's now even possible to buy a 1TB smartphone. At least, this is what it will say on your smartphones packaging, but these figures don't necessarily reflect the amount of space that is available to you. Part of this is taken up by the system itself and bloatware. The low end: is 16GB enough? Smartphones with just 8GB are quite rare now, and with good reason: just the files received on WhatsApp and a few photos are enough for the system to start lagging with such limited storage. Personally, I'd advise against choosing this option. You can just about survive with 16GB, but take this advice: you'll have to make sure you clean up your smartphone from unnecessary apps and take advantage of cloud services such as Google Photos, for example. 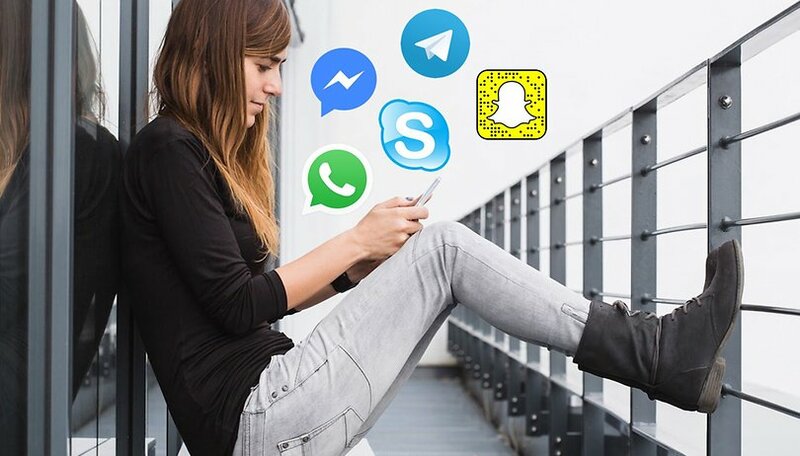 Heavy multitasking and demanding games are a definite no, so therefore your experience is limited to general web browsing, emails, WhatsApp, and not much more. At the moment, some low-end smartphones still offer 16GB of storage, including Samsung's popular J line (J3 2017, J5 2017 and J7 2017). All devices should offer at least 32GB of internal memory. 32GB is reasonable, unless you're used to taking a lot of photos and the cloud is still a world you don't know. In any case, this is a good solution for those who don't need a top of the range device, and don't require a lot of apps. Another example, again, is Samsung with its Galaxy A6 2018. A robust 64GB is a decent choice. This option allows you to have enough space for apps, photos and other files, and you won't have to deal with constant system slowdowns while playing games or multitasking. Fans of mobile games with good graphics, which can often take up several GB per game, should consider 64 at the very least. The Razer Phone 2 has a nice combination of 64GB storage and 8GB RAM, both fast and roomy enough for a games library with PUBG Mobile, Fortnite, Darkness Rises and so on on-board. The Samsung Galaxy S9, still a great phone now more affordable then ever, also comes with 64GB as standard. 128 and 256GB are two options no longer reserved for the top flagships. Upper mid-rangers like the Samsung Galaxy A9 can boast 128GB amount, and even high-end devices from budget brands like the Honor View20 also pack plenty of storage at 256GB. The OnePlus 6T and the new Samsung Galaxy S10e also come in these configurations. But to really stake your claim at the top in 2019, one must offer a whopping 512GB storage. A number previously unthinkable on a smartphone, but as we know, the numbers keep going up and up. The Xiaomi Mi MIX 3, among its many other attractive qualities, comes with 128GB-512GB storage depending on configuration. The Samsung's new Galaxy S10 can have up to 512GB, and the Galaxy S10 Plus can go all the way up to an absurd 1TB, or 1,000GB! Suffice to say, that such an outrageous number may become more common years from now, but hardly anyone has a need to keep such vasts amounts of data on their smartphone. If money is no object, or if you're using your phone as a mobile workstation to create and edit videos, then you might be grateful that a smartphone can now break the 500GB mark. But most of us will struggle to fill up 128GB. Your budget and the way you use your smartphone are the two factors to consider when choosing the best memory option to suit your needs. Media files take up a lot of space, and one way to solve this problem is to reduce photo quality in your camera's settings. However, this is not ideal if you're a keen photographer, so forget devices with 16 or 32GB is this is the case. Regarding apps, you can enjoy music and TV series by using streaming services such as Spotify and Netflix, for games though, it's different. Gamers: compromising isn't an option, you need to go for more storage. As for other users who only like to play games occasionally, you should ensure that you clean up unused apps, and any other type of unwanted files. How much storage do you need on your smartphone? Go to the settings on your smartphone, how much memory do you have available? How much memory would you ideally like to have on a new device? Let us know in the comments. Just got S10+ a week ago, brought over about 25gb of photos, videos, other files and I am all ready at 122gb. Not sure how it happened, but there must be a lot of bloatware on this phone. Luckily, I got the 1tb phone. Works great, though. Don't regret buying it. I currently have 11GB of the 32GB free, so I would be comfortable with 64GB storage. This 11GB would be zero if I added my music files to it. within reason any small amount is sufficient. stuff everything on a cloud somewhere. uSD cards are still absurdly expensive and slow for what you get. I am a writer for app reviews, installed a bunches of apps on my Android phone. A big sized memory is required, so I chose the 128GB. And the size of your device is based on your needs. There is a difference between memory and storage. Based on the title, I read the article expecting a discussion of the merits of 4,6,8 Gb of Ram. Instead, the article discusses storage, which is an individual's usage decision - not a technical issue. Disappointing. Another recycled article. Poll is missing the 16gb option. The answer is a min. 16gb WITH an option for an SD card. The principle of "the most memory is the better" does not mean that the phone will go better, just the waste of money. If you need more storage, you have the microSD card available. As well, cloud solutions can be used for storage, with Internet access speeds now at very high levels. As well, for those who need to store lots of files, the portable version has the ability to save to an external SSD connected to the phone via the USB port. On the opposite side, a 1TB storage phone seems stupid, a smartphone is still a smartphone, and it's not a computer or a graphics station, or a camcorder to need such a waste of shocking space. Because in this case, the current consumption is higher, the battery needs to be bigger, and hence harder, and the problems are chained. My previous 2 phones had 64, plus the option for an external SD. I never even filled 1/2 of that space. Photos, generally are on my Adobe cloud account. Music, I stream. My phone now has 128 meg...I'll never fill half of that. Normally I am the opposite when it comes to sounding like a stereotypical gay man, however when it comes to Flagship Smartphones I personally feel the bigger the better & the more memory the better, I hate to sound like a size queen but when it comes to Android Smartphones the bigger the better & the more memory the better & the best new hitech goodies that's packed in with the larger size of the phones is hands down the best device on the market, they can't be beat, especially not Samsung, the rein over the Smartphone industry. but I was going to get that phone I was going to buy the Hawaii honor Note 8 but it's it is not available in the US b/c it it did not get approved to be released in the states which was total freakin BS but anyway I hope that the Hawaii Honor Note 9 comes out and it comes packed the 6.6 inches & titanium body & top of thd line screen as far as resolution & crack resistant & is fully waterproof & packed with all of top of the line technology inside of it with no expense spared and I hope it is released in the states & if it does get released in the states then I will actually consider leaving Samsung for the 1st time sine the Samsung Note 2 came out, I have a feeling that's not gonna happen though so I will not be leaving Samsung, so I'm hoping that Samsung will make a competitor for the Huawei Honor Note & Note 9 with 6.6 inch screen & a titanium body & packed with the highest tech available & be fully waterproof & have 265 gigabytes of storage & be able hold 400 gigabytes SD-Card or more, if Samsung comes out with a phone like that then I will be buying it & I will continue buying it generation after generation. the more storage the better, sd cards dont put the whole app on them, unless you have adaptable storage. you only get to put data on the sd card. so you still need at lest 64 gigs. i like 256 gigs. but Samsung nickel and dimes us on these so called flagship devices. these upgrades are so miniscule , string us along. i am using my last samsung device. s8. time for a change. too much bloatware , slow updates, still waiting for oreo 8.0, f**king joke. the s9 will be out in a week or so, and samsung thinks we are gonna throw away our s8s after a year, ya,i will, but not for anouther samsung. Wow. That comment kinda went off topic! 128GB is a minimum without microSD support. the preferred would be 64GB with a microSD support. I'd then add a 200GB card. I prefer 256GB in my next phone if it does not have a microSD slot.